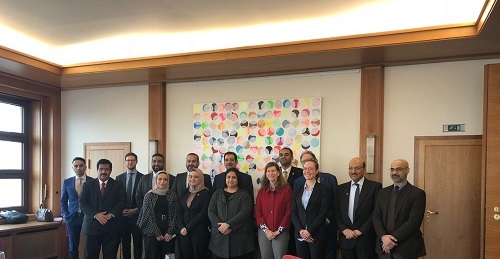 The delegation of the National Committee on Prohibition of Chemical Weapons Development, Production, Use and Stockpiling and their Destruction, headed by the Undersecretary of the Ministry of Foreign Affairs, Dr. Shaikha Rana Bint Isa bin Daij Al Khalifa, paid a visit to the Federal Republic of Germany on 5-7 February 2019, as part of the National Committee's keenness to strengthen international cooperation and exchange of expertise in the field of the non-proliferation of weapons of mass destruction. This visit, which is the first of its kind, intended to shed light on the experience of the Federal Republic of Germany in the national application of the Convention on the Prohibition of Chemical Weapons and other relevant conventions. The agenda of the three-day visit included several meetings and lectures held by the Federal Foreign Office, the Federal Ministry of Defence and the Robert Koch Institute. Dr. Shaikha Rana also met with the Federal Government Commissioner for Disarmament and Arms Control, Ambassador Susanne Baumann, where she reviewed the Federal Republic of Germany's policy on arms limitation and non-proliferation of weapons of mass destruction, which constitute all the needed efforts to become an active member of the Organization for the Prohibition of Chemical Weapons. The delegation was also briefed on the German efforts to destroy the remaining chemical weapons in the territory of many States that had experienced wars and conflicts, clarifying the national mechanisms of the Federal Republic of Germany to ensure the implementation of the Chemical Weapons Convention and the Biological Weapons Convention and the pivotal role of the Federal Foreign Office in this regard, as well as various means and mechanisms adopted by the Federal Republic of Germany to ensure the safe export and supply of dual-use materials. 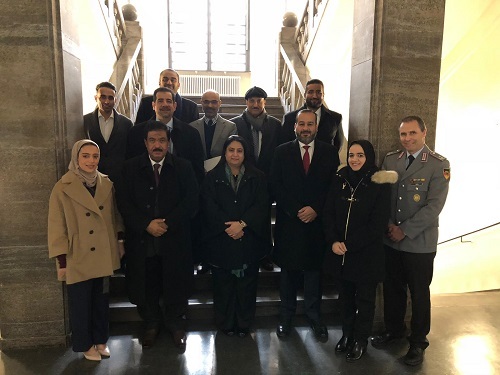 The delegation of the National Committee on Prohibition of Chemical Weapons Development, Production, Use and Stockpiling and their Destruction also visited the Federal Ministry of Defence. The Federal Ministry of Defence reviewed the efforts of its representatives in implementing the Convention on the Prohibition of Chemical Weapons and the Biological Weapons Convention through its collective work with the Federal Foreign Office, notably the dispatch of teams to inspect the military installations of the States parties to the above-mentioned conventions and accompany the delegations that visit Germany to conduct mutual inspections. The delegation of the National Committee also attended a programme held at the Robert Koch Institute, which included a number of lectures on the threats of bioterrorism and the methods taken by the Federal Republic of Germany to combat this crime, including the methods of its biosecurity programme. At the end of the programme, the Federal Foreign Office hosted members of the delegation of the National Committee to enlighten them on their experience in the field of security studies in Germany, how to deal with scientific research in that field, and develop a framework to regulate their publication to prevent the exploitation of these studies by groups or entities that aim to develop biological weapons. The Director for EU Sanctions at the Federal Foreign Office briefed the members of the National Committee on the mechanisms of applying the sanctions imposed by the Security Council on normal persons and legal entities as well as the mechanism for including entities and persons on the European sanctions list. On the sidelines of the visit, Dr. Shaikha Rana met with a number of officials of Federal Foreign Office, and reviewed the work of the National Committee on the Prohibition of the Development, Production, Stockpiling and Use of Chemical Weapons and on their Destruction and its most important achievements over the past years. Officials of the Federal Foreign Office welcomed the delegation of the National Committee, stressing the importance of strengthening bilateral cooperation between national bodies concerned with the implementation of the Convention on the Prohibition of Chemical Weapons. They also affirmed the remarkable development witnessed by the Kingdom of Bahrain in the implementation of national mechanisms and bilateral cooperation in the field of the elimination of weapons of mass destruction and the achievement of international peace and security, expressing their aspiration for further cooperation and joint coordination in this field. The delegation of the National Committee on the Prohibition of the Development, Production, Stockpiling and Use of Chemical Weapons and on their Destruction was headed by the Undersecretary of the Ministry of Foreign Affairs, and included representatives from the Ministry of Interior (General Directorate of Civil Defence and Customs Affairs), the National Oil & Gas Authority, Ministry of Industry and Commerce, the Electricity and Water Authority and the University of Bahrain.